The TBM Owners and Pilots Association is pleased to announce another benefit of membership. 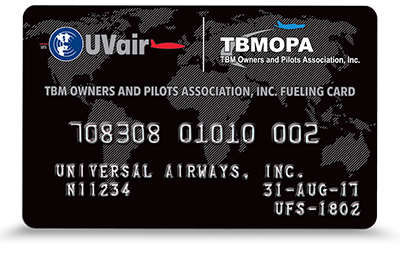 TBMOPA and Universal Weather and Aviation, Inc. (UVair) have developed a co-branded fueling card which allows additional discounts on fuel and other aviation services. This card carries the identity of TBMOPA and UVair. More importantly, the use of this card gives additional fuel and other discounts which is another advantage to TBMOPA Members. Fuel prices are very competitive and dynamic but UVair has established addition fuel discounts unique to TBMOPA. These discounts will average 5-10 cents per gallon beyond the already discounted UVair fuel services. Additionally, Universal Weather offers many other aviation services with special pricing for the TBMOPA cardholder. Even if you presently use a UVair fueling card or other contract fueling cards, you will want to sign up for this special TBMOPA group program. Note: You must be a TBMOPA Member to sign up for this program.